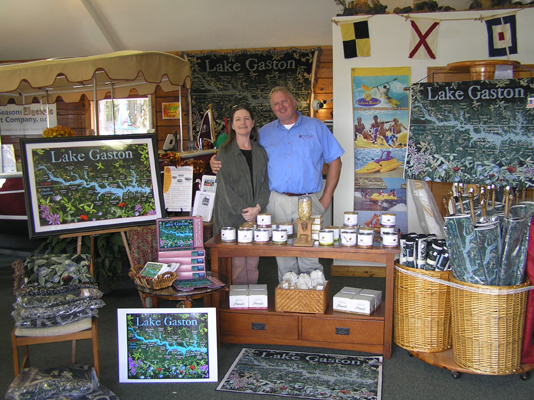 "The Creeks of Lake Gaston"
Related article: More Than a Map, Lake Gaston Becomes Art. if you are interested in purchasing from the collection, contact the Lake Gaston Chamber and Visitors Center at (252) 586-5711. As Four Seasons continued to evolve its product offerings each year- we thought it time for a Lake Gaston product line that really shows the lake. Our decision to move forward was also in response to the large number of requests we were getting in our showroom. (LKG from Story Properties is great and very successful; but we were hearing an interest for a line that offers a visual Lake Gaston motif.) This sort of thing is exactly in line with our "lake boutique approach" to our year-round business; we decided now was the time. The project started in September 2005 with the creation of the design working with Tim Lee, of Simply Tim Productions. (Tim also happens to help us in our showroom - a man of many talents!) Our goal was to have product in time for the holiday season - and we made it by the skin of our teeth! While note cards were first available at Thanksgiving; the cotton throws finally arrived on Dec 23! 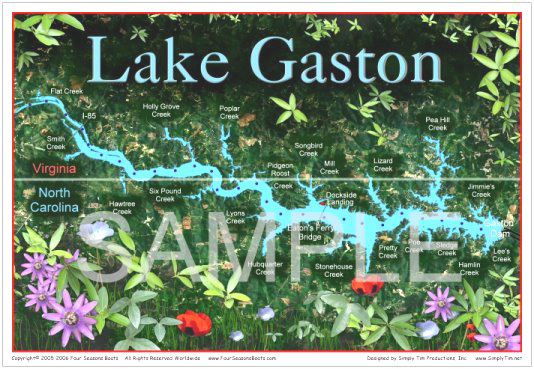 For our design, we thought that a decorative map would be something that would appeal to everyone with an immediate connection to be able to show "where you are" on Lake Gaston. Our next decision was level of detail and decided to go with original creek names that are still used today along with the state border. We had one caller who brought the spelling of Pidgeon Roost Creek to our attention - all current references use "Pigeon" (no "d"). The original spelling does in fact include the "d". We also made a point of including the apostrophe in Eaton's Ferry Bridge - the original spelling - as it reflects a reference to the Eaton family. The detail on the posters is exquisite as your can see the granularity in the aerial photograph we used as our base map. The cotton throws are wonderful: comfy, decorative, sturdy, large and informative! The note cards are large enough to show the creek name (but still uses a regular first letter stamp!) - and work for all occasions. The cutting/serving boards add counter decoration to your kitchen and perfect for a small workspace...and definitely a conversation piece when entertaining. We've heard they also make great placemats! For 2007, we added 3 new products: jigsaw puzzle, floor mat, and a wall-hanging. Plus our 2007 throws reflects a new weaving showing more granular detail of the lake. Yes - we are very "proud parents". We appear to have hit the mark on the design and the initial product offering - as they are proving to be "must-haves" for all who see them!